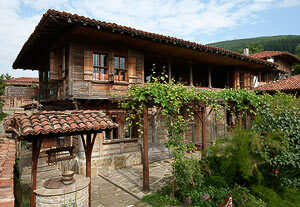 Eco-house in Zheravna village, Bulgaria! 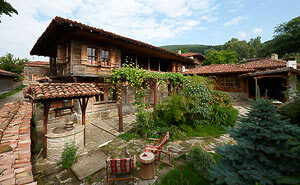 Eco-hotel Zheravna is located in the eponymous village, 16 kilometres away from the town of Kotel. The hotel has the capacity to host 13 guests in an authentic revival house with a 300 year history. A truly unique mix between the spirit of past centuries and modern luxury. Eco-hotel Zheravna opened doors on the 8th of May, 2003. It is classified as a 3 star hotel. The hotel is a typical revival house, a certified monument of culture and architecture, located on the main tourist road in the centre of the village which is also an architectural preservative. The house is two stories high, with a typical design of spaces and a 300 year history. After its’ renovation and modernisation the house became one of the first in the area to blend traditional revival architecture with modern luxury. There are 5 Guest Rooms – 1 bedroom, 1 bedroom plus additional bed, two 3-bed bedrooms and a studio for 3. Every rooms is designed to combine comfort and luxury with folklore motives and authentic historical decorations. Every room has an individual bathroom, mini-bar, safe and a satellite TV (Bulsatcom). All rooms have preserved the architectural style they had before the renovation with hand-crafted wooden elements. There is free WiFi Internet available. The first floor contains two rooms, a service room and a living room for common use which is a representation of the authentic living room, having a fire place and authentic sofra tables. The second floor contains the remaining 3 bedrooms plus a spacious porch with a coffee corner and a summer bed. The hotel is designed with local heating to ensure the comfort of our guests. The hotel has autonomous electricity supply as a backup in case of power outages. Service is 24 hours. The small house for our staff is located right next to the guest house and is a stylish copy. Our guests can also enjoy the spacious terrace styled yard, designed to represent the folklore of the Bulgarian Revival, displaying unique, authentic items that characterise the era such as a traditional Zheravna stone oven, an authentic well replica, a small rockery and an open space for rest and relaxation. Our guests also have at their disposal a fully equipped kitchen where they can prepare their own food and cook at no extra charge. The roads to the village are good. During the winter time they are frequently cleaned. There is also good mobile coverage for all domestic operators. The climate is mountainous, healthy and beneficial for people with respiratory, gastrointestinal and heart problems. Leisure time can be used for trips to Kotel town, the ancient village of Katunishte, the “Sinia Vir’ area near Medven or fishing in the micro dam near the village. 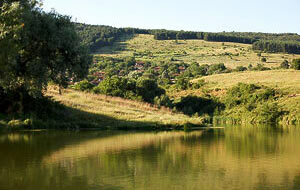 Fishing enthusiast can try their luck, trout fishing in Kotlenska river, or perch and white fish fishing in the natural ‘Skala’ lake near Zheravna. Not too far away are the ‘Ticha’ (75km) and ‘Kamchia’ (60km) dams where you can fish for carp, white fish, crucian, perch, catfish and others. The forest is easily accessible, rich flora and fauna, mushrooms and herbs. There is the option for horse rides and organised hikes by the distinguished eco-roads. The village has a couple of taverns, a permanent display in the art gallery, a collection of Christian icons from the 16th, 17th and 18th centuries displayed in the church which is also an architectural and cultural monument of European importance. Other attractive tourist destinations are the museum-houses of Yordan Yovkov, Sava Filaterov and Rusi Chorbadji. In the latter there is an ethnographic display of the museum complex. Zheravna is a place where time stands still – the cobblestones still remind us of our forefathers’ footsteps and the wooden houses of the patriarchal way of life in the centuries gone by. The narrow streets and spacious yards, filled with flowers and boxwood, bring us peace and quiet that we lack in the fast and noisy city.